What is Formula 82M Topical Minoxidil Rogaine Alternative? 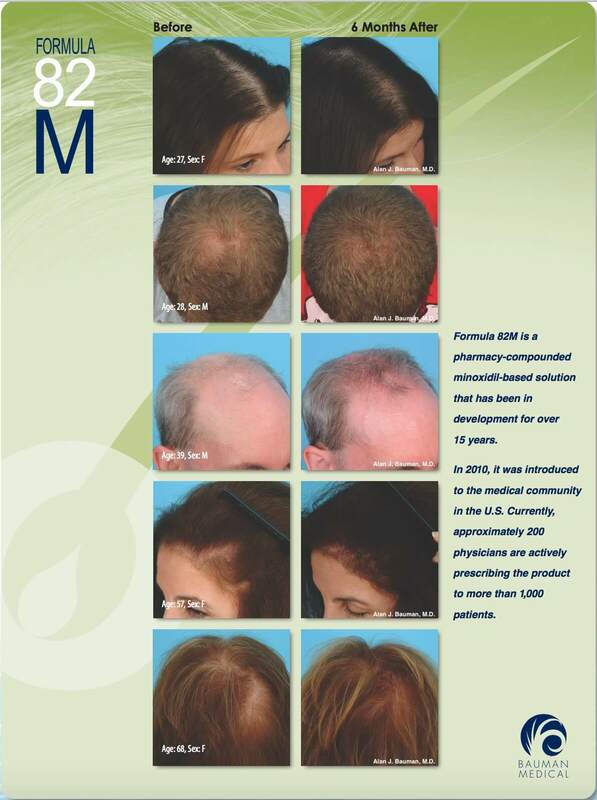 “Formula 82M” is a customized compounded prescription solution that contains the FDA-approved hair growth medication Minoxidil 5%, Tretinoin 0.01% for enhanced penetration and hair growth effect, the anti-inflammatory Fluocinolone 0.01%, an organic anti-androgen Oleanolic Acid and a sophisticated blend of powerful antioxidants, scalp conditioners and hair conditioners in a non-irritating propylene glycol-free base. Looking for a quick-dry alternative to over-the-counter minoxidil rogaine solution or foam that doesn’t leave a thick greasy residue? Created using a well-researched proprietary process (that literally took 82 revisions! ), Formula 82M offers more powerful penetration of minoxidil in a non-greasy, quick-drying, user-friendly, stable formula for men and women. Formula 82M is a compounded minoxidil that is our most popular Rogaine alternative. 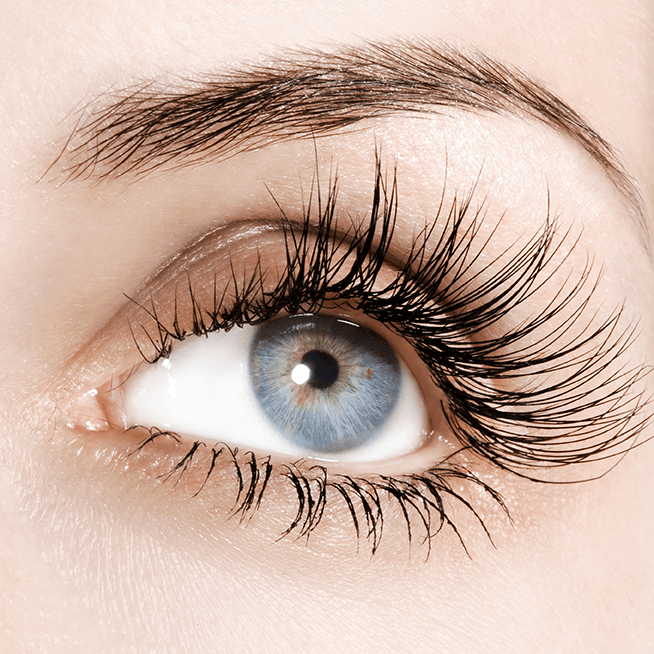 What can the average person expect to achieve with Minoxidil? Topical minoxidil has been researched for almost thirty years in hundreds of scientific studies involving thousands of patients with thinning hair and hair loss. Twice daily minoxidil has been shown to regrow hair in up to 85% of men and 60% of women. Formula 82M is an alternative to Rogaine and Rogaine Foam that provides an even greater penetration of minoxidil and the benefit of synergistic ingredients compared to the over-the-counter generic minoxidil or Rogaine without the common side effects. Why Compounded Minoxidil Formula 82M? Unfortunately, despite the hair growth properties of minoxidil, the over-the-counter Rogaine, Rogaine Foam or generic versions can often come with unwanted side effects like itchy scalp, scalp irritation, sticky and oily or greasy residues that interfere with hairstyling and more. However, clever compounding chemists have invented new ways to make minoxidil simply “work” better and leave less annoying greasy residue behind. After 82 different attempts at mixing minoxidil differently, pharmaceutical chemists working closely with hair loss physicians “discovered” the best formulation: Formula 82M. How is Minoxidil Formula 82M applied? 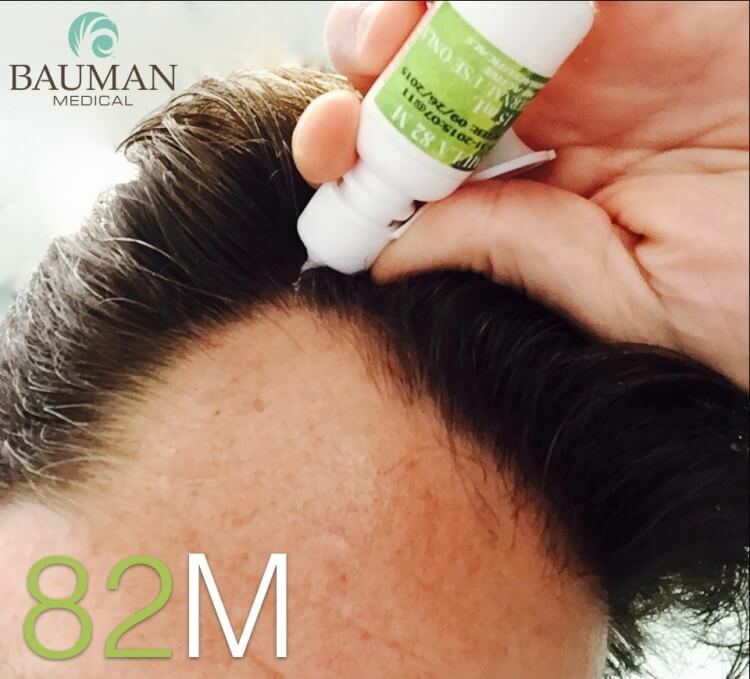 Dr. Bauman recommends that at least 20-30 drops of Formula 82M should be applied twice daily to the entire scalp, focusing primarily in the areas of concern. For maximum effect, minoxidil should be spread evenly and allowed to absorb for at least three hours before showering, swimming or participating in heavy physical activity. A special ‘droptainer’ bottle allows for the accurate application of Formula 82M directly where you need it… on the scalp, not on your hair. How does Minoxidil Formula 82M work? Despite extensive research, the exact mechanism of action of minoxidil remains somewhat unclear. However, it is well accepted that minoxidil is a potent hair growth stimulator, causing resting follicles to produce hair and weak follicles to produce longer thicker and more pigmented hair over time with consistent use. 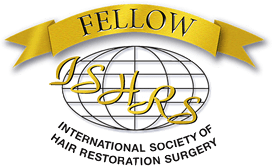 Dr. Bauman may prescribe Formula 82M Minoxidil in conjunction with other hair restoration treatments like finasteride/Propecia, low level laser therapy, hair transplantation, PRP, etc. When should I start Minoxidil Formula 82M? What areas are normally treated with Minoxidil Formula 82M? Contrary to popular belief, Minoxidil Formula 82M will work wherever there are weakened hair follicles. 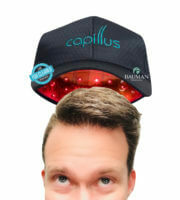 Common treatment areas include the crown/vertex area (top of the scalp) as well as the frontal/temple areas. Minoxidil also prevents hair loss and thinning in the at-risk areas. 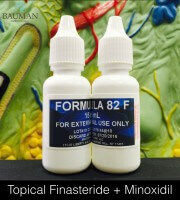 What are the typical side effects of Formula 82M compared to over-the-counter minoxidil solution? The scalp may appear slightly more pink than usual due to increased blood flow from Formula 82M minoxidil. The most common side effect from minoxidil is skin irritation. Redness, dryness, flaking, inflammation and discomfort at the scalp are possible. Thankfully, skin irritation and other related side effects are extremely rare with Minoxidil 82M because it has anti-inflammatory properties and contains absolutely NO propylene glycol (found in over-the-counter minoxidil solutions). 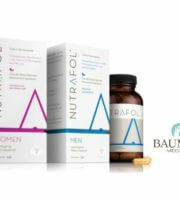 Discontinue therapy and notify Dr. Bauman immediately if you experience side effects from any treatment. Will Formula 82M leave my hair greasy like Rogaine and Rogaine Foam? No. The sophisticated proprietary process used to create quick-drying Formula 82M allows it to be absorbed more quickly and leave no sticky residue common with over-the-counter Rogaine minoxidil or other prescription solutions. Applied correctly, there should be little to no impact on your hairstyle. Many patients find 82M to be a good alternative to topical Rogaine (and Rogaine Foam) because it does not leave a greasy gooey residue. When will I see results with Formula 82M? Even if you are already using over-the-counter Rogaine or Rogaine Foam, increases in hair growth from Formula 82M minoxidil can be seen as early as ten weeks* using a video scalp microscope or by HairCheck™ measurements. 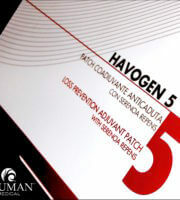 Cosmetic benefits may take six to twelve months to be noticeable in the mirror or photos. Remember that starting a new, more powerful topical minoxidil or other treatment can trigger a temporary shedding of hair–this is a sign that it’s working! Hair Mass Index measurements with HairCheck will improve in as little as 90 days. 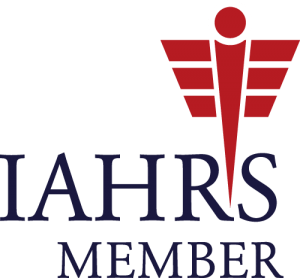 Is Minoxidil Formula 82M covered by my health insurance? Unfortunately, no. Compounded Formula 82M minoxidil is not available at traditional pharmacies and is not covered by health insurance. In order to obtain a prescription for Minoxidil Formula 82M and receive it for your use, you will need to first have a consultation with Hair Restoration Physician, Dr. Alan Bauman. 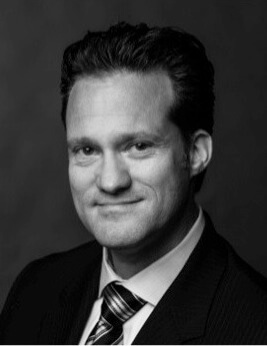 Consultations with Dr. Bauman can be completed in-person or long-distance (phone or Skype/FaceTime) here. How do I get started with Minoxidil Formula 82M? A one-on-one consultation with board-certified hair restoration physician, Dr. Alan J. Bauman, M.D., is the best way to determine if you are a good candidate for Compounded Minoxidil Formula 82M. Routine medical tracking is recommended in order to achieve the best possible results with Minoxidil Formula 82M or any hair restoration regimen.